I am Anji Chagaleti. 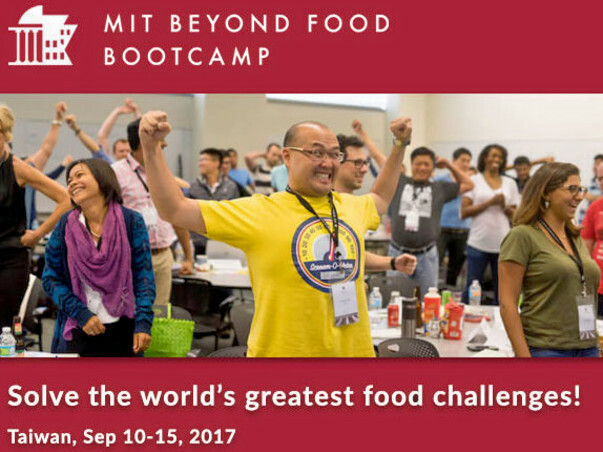 I was recently selected to be a part of MIT's Entrepreneurship Beyond Food Bootcamp in Taiwan. It condenses 2-3 years of startup experience into an intensive week-long program. I think that Entrepreneurship is a long journey; Entrepreneurs are capable of learning and thinking in the terms of innovation by looking at real life problems instead of looking at ideas. My father is a farmer and it is with his hard work that I became the only graduate in our family. Being from a middle-class family, I have always had challenges in getting finance for my education. By attending this Bootcamp, I will get to meet and work with like-minded and entrepreneurial driven candidates. To be an entrepreneur it is life-risking but this program will open windows to the world to think broader. I am a quick learner who believes in life-long learning. Where ever I joined or worked with, I always worked hard with passion towards the outcome. So, I would like to experience the life-defining event. I should pay ₹128860($2000) by July 12th, 2017 to confirm my attendance. And the remaining fee ₹357846($5551) should be paid on or before July 30th, 2017. Your support and contribution will help me in experiencing this wonderful opportunity. Please share on your social media and also with your friends/colleagues. Please let me know if you come across any societies or government or individuals who are willing to sponsor me. 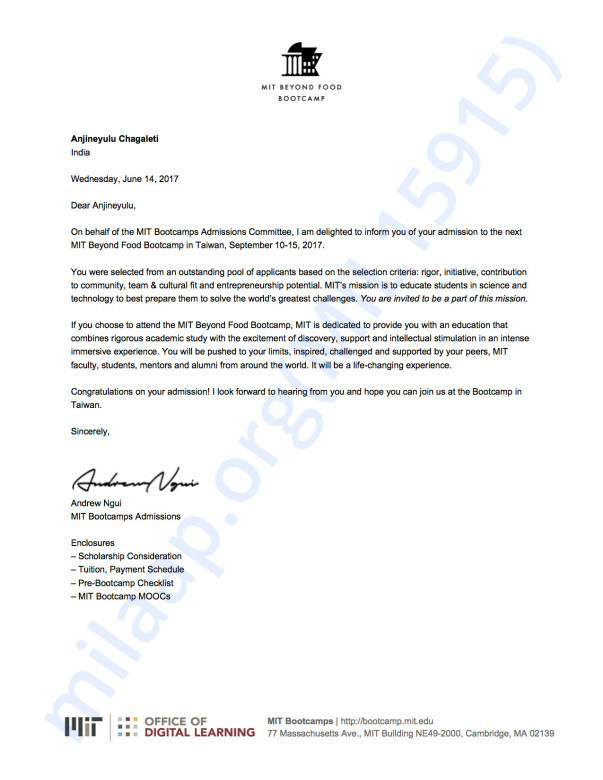 My MIT's Entrepreneurship Bootcamp invitation!! Thank you very much for the support. I traveled in Jagriti yatra train for 15 days with 500 amazing people. It was a wonderful opportunity to meet so many generous and inspiring people on the train. Jagriti Yatra inspired me to think beyond borders. Without your help, this would not have been possible. Please download overall compiled information (126 pages book) of this year's Yatra experience. Thank you so much for your support. Each one of you brought me closer to my dream of attending the MIT Bootcamp. However, I was unable to arrange for the complete amount and unfortunately had to give my admit a pass. I believe humans are gifted to create our destinies. And once again, I am taking a step towards creating an experience for myself. The great news is, I have been shortlisted as a Jagriti Yatra fellow and I am super thrilled about it. So here I am requesting your support one last time! I am aware you contributed to help me make MIT happen. However, I will be immensely grateful to you if I have your permission to use your contribution for my Jagriti Yatra. 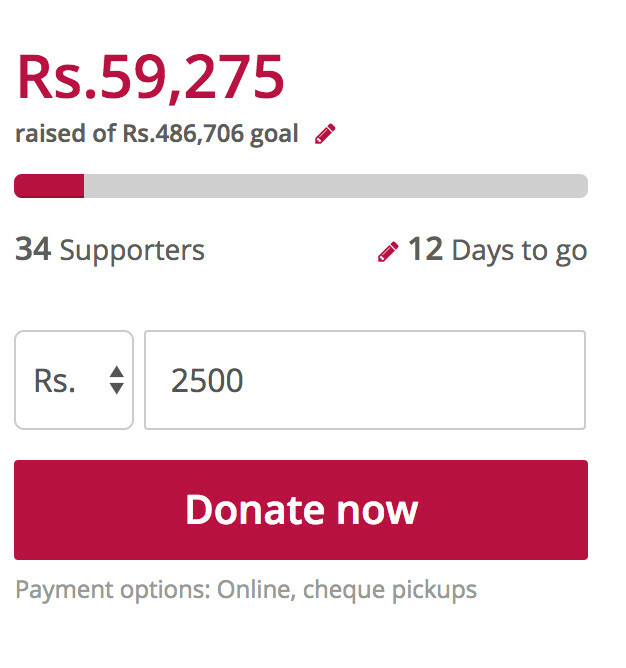 To accept the Fellowship offer, I have to make a payment of 60,000 INR and your contribution will help me do that. However, for any reason if would like to request a refund, feel free to revert to this email with your request within 7 days. Be assured, Milaap will process the refunds on priority. Thank you for supporting my campaign. I have been trying my best to raise funds to attend this career defining opportunity. So far, I raised Rs. 59,275 out of Rs.486,706. I have only 12 days to raise remaining funds. I would request all of you to share about the campaign with your friends in Social Media and also offline channels. 5. I will apply knowledge gained through courses and push limits to get the best end product. 6. I will work on Food related problems. Your friend Srishti Sinha told me about you. :) Hope this helps you achieve your dream!